Hello and welcome to the Welsh Springer Spaniels Australia web site. The web site began as the official site for the WSSC of NSW. The Club unfortunately folded at the end of 2010. It is now the aim to provide a site for owners and breeders of Welsh Springer Spaniels in Australia to enable effective communication of relevant information for anyone interested in this lovely breed and enhance the future of the breed in Australia. Welsh Springer Spaniels are keen and successful participants in all aspects of dog sports (conformation, obedience, agility, tracking, retrieving, dancing with dogs), and most importantly always an active and loving member of his/her family. Input is welcome, including contributions to the pictorial landscape of the site. Thank you to everyone who has already sent in articles and photos. 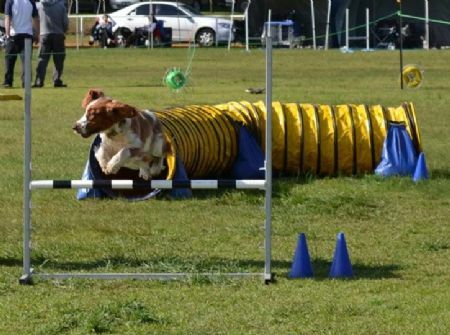 This group is for Welsh Springer Spaniel breeders, owners and fanciers. It is a forum where members can share knowledge and keep informed about the breed, share experiences and stories. Please contact the owner if you would like to participate.